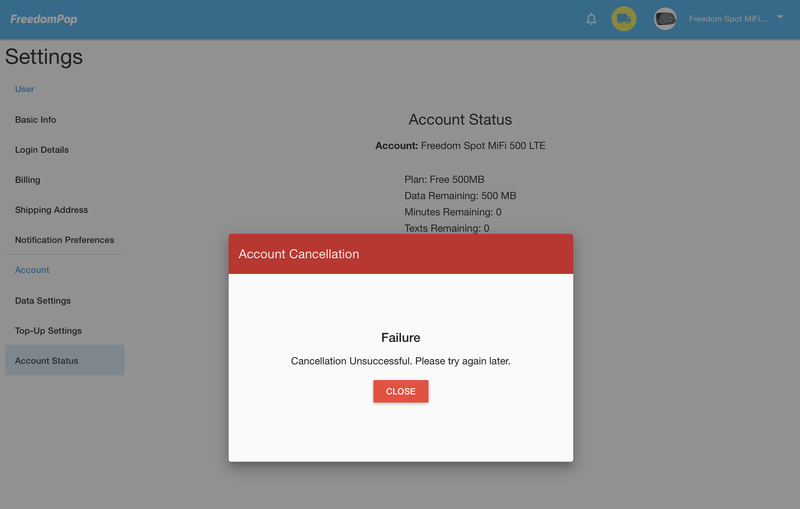 I have tried several times to cancel my account online but I keep getting an error message, saying "Failure. Cancellation Unsuccessful. Please try again later." You can see can see a screen shot with the error message in the attached file. Can you please cancel my account? I no longer use the devices associated to this account. Please try to perform this action from an incognito tab on your browser by pressing "Ctrl + shift + N" in the keyboard while navigating. You may also try to clear cookies and Cache of the web browser or Try in a different browser. If the issue persists please forward a screenshot of the error you get. We checked but there is no attachment for the error you are getting. I have the same issue I tried to cancel account after mistakenly selecting the promotional offer, which I did not need. The cancel account option does not work. Admin can you please cancel my account (732) 515-3745? Since I live abroad, I was wondering if you could proceed with the cancellation on your end. I would really appreciate your help.